In this project, I created 3 reproducible sets of objects. I explored how I could craft and foster objects that would remain compelling and endure. Rather than beginning with questions of function, I challenged myself to begin with questions of materiality. As a designer, it was initially difficult to detach from a lens of utility and function. I began this project by delving through some of my favorite past projects and looking at what qualities were most compelling to me to work with and continue experiencing up until the present. In the past, I’ve enjoyed working with materials like clay and I wanted to explore possibilities that had similar qualities of permanence. Which Qualities in My Past Projects Have Endured? Clay was one material that I particularly enjoyed working with. Not only are there physical possibilities of form, but the qualities of weight, temperature, and age make this type material intriguing to work with and to experience. I wanted to explore materials that had similar qualities but allowed me to reproduce 3 identical objects. Although clay remained an appealing material, it works best to create unique one-of-a-kind forms rather than identical objects. I quickly learned that the process of pouring concrete was much more difficult than anticipated. Achieving the correct powder to water ratio and pouring enough volume in the short time frame the concrete was still fluid was incredibly arduous, not to mention doing it all with eye, mouth, and hand protection. However, after waiting for the concrete to cure, I found myself drawn to the way the concrete retained the shape of its mold with high accuracy, opening a door to a wide range of forms to explore. Furthermore, the concrete also held many of the qualities that I enjoyed experiencing with clay. I jumped into pouring concrete which would be much more repeatable than individually sculpting forms. I began pouring some basic shapes and structures and looking at how the concrete cured and took on forms. I experimented with mixing ink in, layering the concrete, and even breaking the concrete after it cured. After showing the test pours that I made with others, the question of what shape I was going to pour naturally came about. One thing that I like about discussing ideas with peers is it allows our ideas to exist in a space other than our own heads. 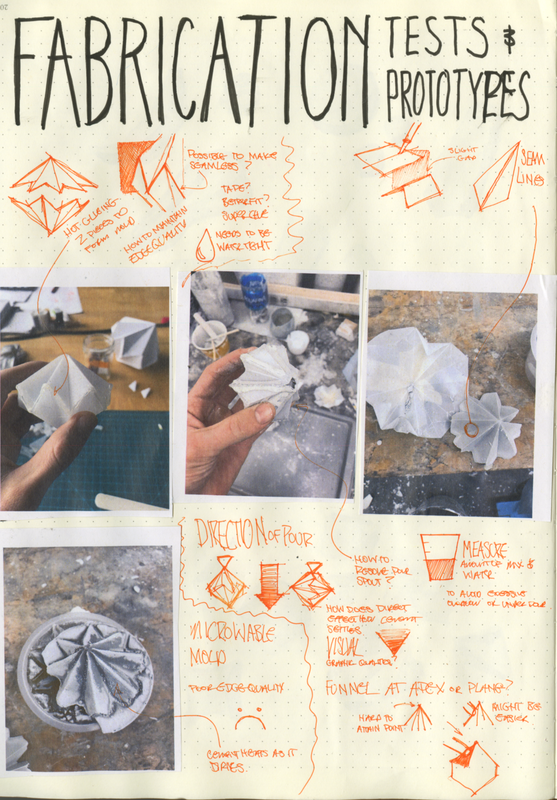 The next step is to make those ideas exist in some kind of physical form. One idea that arose was how the concrete we are used to are so boring, plain, and familiar. What if organic objects were cast in concrete? Have people ever encountered this type of form before? How will they react if they encountered a new object that they were not used to? it gave me an object that I could discuss and share with other people and ultimately take this idea to the next level. Furthermore, it allowed me to practice for capturing specific shapes and pouring them in concrete. Below are photos and drawings of the mold and concrete pouring process. In addition to serving as a conceptual stepping point, this concrete banana also served as a stepping point to greater familiarity with the material, which would help take my fabrication to the next level. 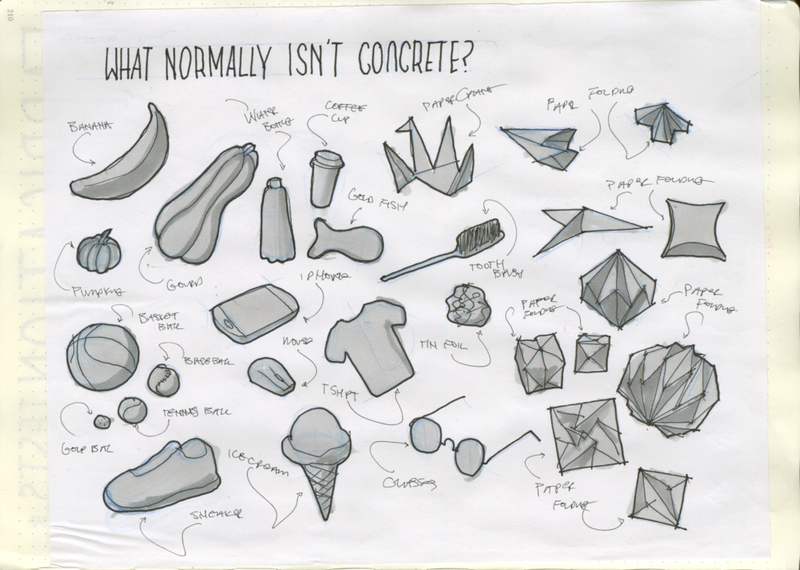 What if Non-Concrete Objects were Cast in Concrete? This question became the driving thought as I narrowed on an appropriate form. I began sketching objects that might not normally be cast in concrete. I loved the idea of experiencing an otherwise familiar or simple object in the heavy weighted material of concrete. From gourds to electronics, the idea that excited me most was paper. Given how minimally light paper is, how would a person respond to a weighted paper form? How do we Experience Paper? So familiar that we don't think about what makes paper paper. Lightness, crispness, blankness are some qualities that come to mind when we think about paper. None of those qualities it shares with concrete, which is why my next step was to try to unite them. These are some paper origamis that I folded. The angular crisp form speaks to the material of paper. Again the qualities of the paper physical form contrast drastically from the physical form of concrete. There was no shortage of challenges with asking concrete to occupy a form normally held by paper. Surprisingly, maintaining crisp edges wasn't as difficult as I expected. The biggest problems stemmed from pouring; getting the proper ratio of water, but also keeping the concrete fluid enough to fit through a small hole, and unclogging that hole if it got stuck before the concrete hardened. Furthermore, I needed to craft each mold individually and by hand. For each pour which would take about a minute, I needed to put in 30 minutes of work; scoring, cutting, and gluing the plastic together and sealing all the folds to prevent leaks. 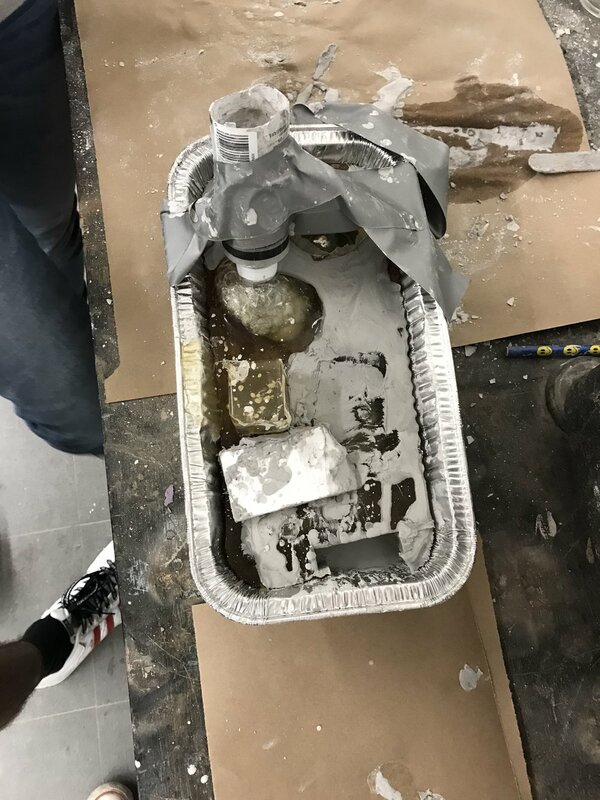 In order to release the cement once it cured, I would have to dismantle the mold, rendering it unusable for another pour. Although time consuming, this mold process yielded the best results; the sharpest lines and lack of part lines. It took many attempts to fully pour the mold in the way I intended. The photos above and below are some of those incomplete prototypes. 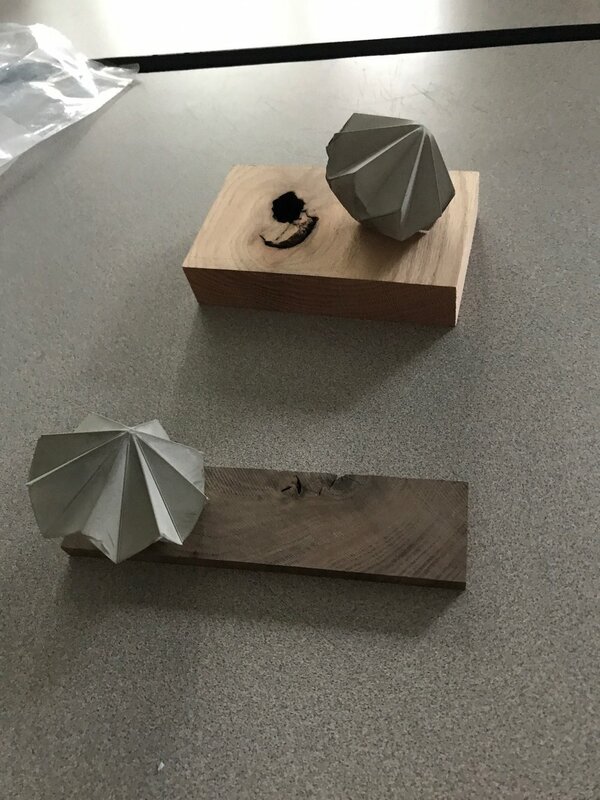 Although incredibly frustrating, these prototypes helped me develop a robust system of recreating these objects as well as gain further familiarity with concrete and the form I was asking it to occupy. Despite consuming time, this mold process yielded the best results; the sharpest lines and lack of part lines. Stopping and listening to what the object is saying when it doesn't work was an important step in developing my response. These prototypes and I would essentially converse with each other as we tried to understand each other. I would ask something of the material, it would respond (often saying "No"), and I would reformulate what I was asking. This cycle would continue as we moved forward. 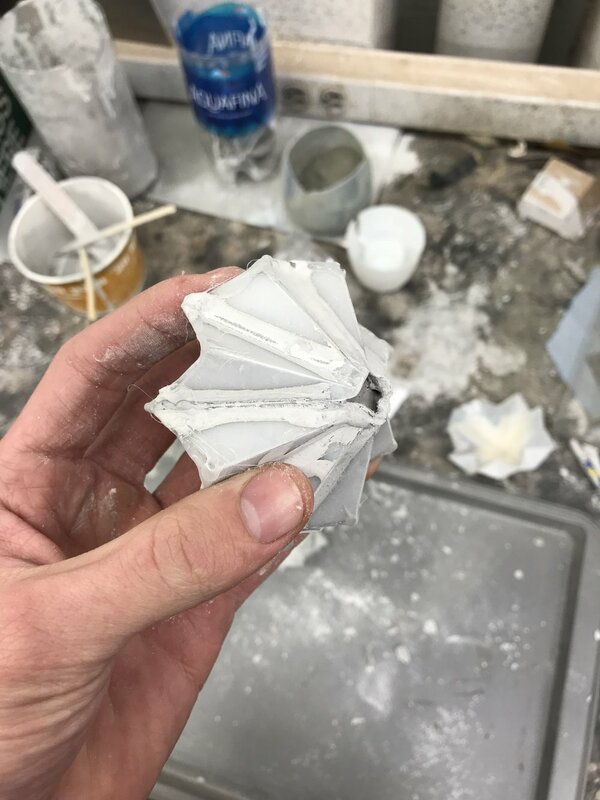 Once I narrowed on the origami form I wanted, I began developing a method to pour concrete to the proper fidelity, craft, and sharpness that it had in paper. To make a mold, I used milk carton plastic, which had the stiffness needed for the mold and the pliability to score and bend similarly to paper. I scored milk carton plastic to fold an empty mold. After gluing together two halves, I had a one time use mold. Nothing is more frustrating when people ask you these question that don't align with your intent. People would pick them up, fiddle with them trying to figure out what it was, and even try to spin them thinking that they were spin tops! After quelling my inner frustration and heat, I realized that this is to be expected when crafting new forms. When encountering new things that don't fit our paradigms or expectations, we desperately try to do what we can to reckon and fit it into our world. I need to better guide people's discovery of these objects; something that could ease unfamiliarity and allow people to accept this new object as it was. While discussing with peers, we thought how we can frame the concrete origami to allow it to speak for itself, rather than through its utility like a spin top would. 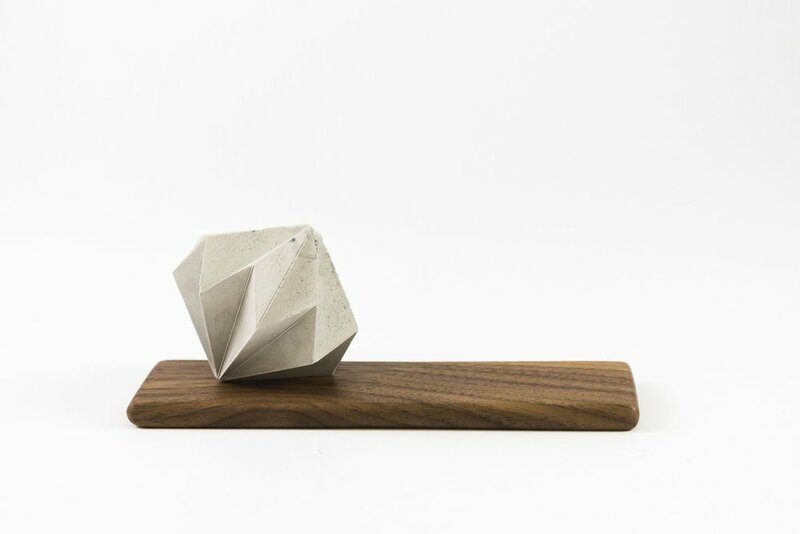 While attempting to figure out how to vignette or plant the concrete origami, we placed it on a simple piece of wood. Giving the concrete origami a place seemed to also give it purpose; rather than an interactive object, the wood and concrete together were expressing themselves more as sculptural pieces which was my original intent. I began sketching and prototyping what this platform could be. Ultimately, I chose a dark walnut and softened the edges to give strong contrast to the angular concrete origami. The organic nature of wood; its rounded edges and grain direction, complimented the cool grey concrete and brought more attention to its angularity. These are the final objects that I created. Besides unrepeatable aspects such as the bubbles in the concrete and the wood grain, all three sets are identical. The concrete origami sits towards one side of the wooden platform, allowing the wood grain to lead into the concrete. This is also one of the only photos of all three objects together. The purpose of having an object fit these 3 reasons was to push my boundaries and allow myself to design for more than just myself or a user. Not only is it important to think about how you will continue to experience an object you created, but how it will exist by itself without you. One final detail that I added was inscribing a K and the number on the back of the walnut slab. I label the 3 objects with their corresponding number and leaving room for me to make more in the future. This inscription also functions as an identifier in the future; something that can keep these objects together and serves as a remnant of where they have been. This object is fairly straightforward. I now keep one set on my desk at school. Thus far it has fulfilled its purpose and I have continued to cherish it as it ages. I continue to ask questions that were sparked by this project: What if the concrete occupied a different shape? What if these items were a set or assemble? What might the next one I make look like? The purpose of giving one away was to be comfortable with relinquishing an object I have craft and to be comfortable with allowing it to living apart from me. Giving up control over something that you spent hours crafting and taking care of was difficult. Luckily I could still control who I gave it to and could still keep one for myself. This is part of the reason I made these items identical as it would allow me to more easily part with them. I gave this concrete origami to my mother. The last item I sold at an auction held by the Society for Contemporary Craft in Pittsburgh, a gallery and store that presents contemporary art in craft material. I added my item to be part of their inventory for a silent auction that they held one night. Out of all the items, I had the least control over the destiny of this one. I had no control over who would buy this item, if they would cherish it or disrespect it. Luckily the item went to a local woodworker who I had the opportunity to have a conversation with before the auction finished and I felt comfortable with his level of appreciation even if it wasn’t the exact same type of appreciation as mine was.